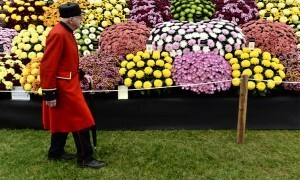 Nowhere showcases eccentricity, flamboyance and colour better than the Chelsea Flower Show. It’s one of the most celebrated horticultural events in the world. Entrants as far away as Australia and Dubai will be pitching their trowels against talented British designers, in the hope of securing the title of best show garden. What better place to welcome in the summer and get inspired? Prince Harry visited the Chelsea Flower Show on Monday morning, to talk about one show garden in particular – the African themed garden for Sentebale – ‘Hope in Vulnerability’. Designed by Matt Keightley, it pays tribute to the new children’s centre in Lesotho. The charity was co-founded by Prince Harry to help the poverty stricken children of the kingdom, many of whom are victims of the HIV epidemic. With a waterfall, some artfully placed African features and brightly coloured flowers, it promises to inject a burst of African sunshine into your day. Among the expected guests included none other than Her Majesty the Queen. Last year, Matt Keightley, was responsible for creating the stunning ‘Help the Heroes’ Garden. In reference to his creation this year, when interviewed by the BBC, he was heard to say, “I’m hoping the Queen will like it – that would be the icing on the cake”. Ruth Willmot has worked alongside the charity to create a show garden in memory of her sister-in-law, who recently lost her fight against breast cancer. Shaped like a double DNA helix, with pink flowers, a stone path and pools that ripple every ten minutes, it highlights the regularity of UK breast cancer diagnosis. Its touching message is one of hope, emphasising the continued need to research and combat this disease. This stunning garden promises to be a brilliant debut for Chatsworth at Chelsea. The garden emphasises the importance of heritage, nature and family, with Chatsworth’s ornamental trout stream and rockery, taking centre stage. The graceful, subtle planting of the foliage reflects the impressive history of Laurent-Perrier and its champagne. This is a garden that depicts the wild, aromatic smell of Provence, France, with its revitalised perfume industry. Here, the importance of heavily scented plants such as bergamot, lavender, rosemary and thyme, are celebrated and planted together, creating a heady, floral garden that delights the senses. This garden is a refuge from the hustle and bustle of modern life, somewhere to relax and reflect. It highlights the delicate balance of the natural world and humankind, with the beauty and poetry of Arabic culture around every turn. For keen gardeners, the Chelsea Flower Show is the holy grail of all things botanical, with over 165,000 visitors expected to attend. Get ready for some magnificent displays, imaginative designs and some awesome planting. If you’re green fingered and seek a bit of inspiration, the event will be on from the 19th to 23rd May 2015. Just remember to book your ticket in advance, as they sell out quick. Happy gardening!